Who do you call when you need a fake swamp with live gators? “They brought a level of authenticity and detail to the project,” said Ande Lund, senior project manager for Civic Entertainment Group LLC, which staged the exhibit for the network. 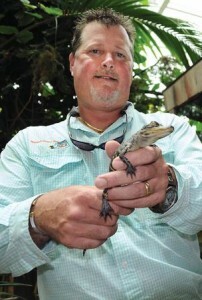 With projects like the Swamp People exhibit, Bottled Ocean Inc. is on track to record $1.2 million in 2012. “A lot of things fell into place for us this year,” said Greg T. Lund, president and CEO. Formed in 1995 as an aquarium construction and management company, Bottled Ocean got into aquatic management and consulting in 2006 when it took over Gaylord Palms Resort & Convention Center’s seven different themed water areas. That led to Paragon Casino Resort in Marksville, La., contracting with Bottled Ocean to help develop its bayou-themed atrium. “If you help other people achieve their goals, you will achieve yours,” said Lund.